Judges himself as strong or weak, smart or stupid? Looks for too much certainty in a world full of uncertainty? Over-monitors his decisions as right or wrong, good or bad? Reacts emotionally when things don't look right? Thinks in terms of extremes (i.e., all or nothing, black or white)? 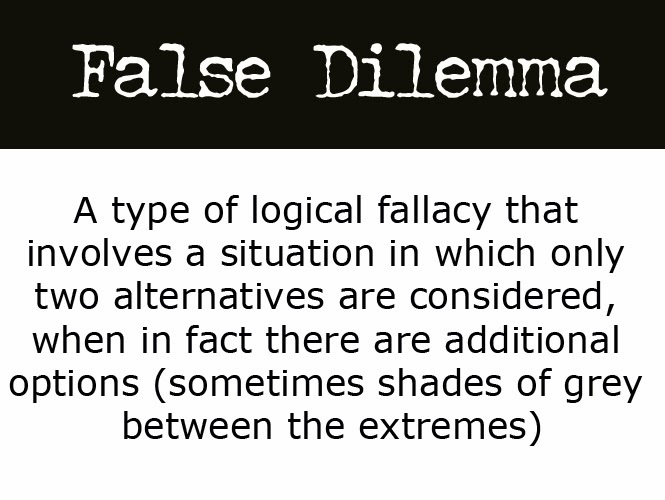 If so, then your child may be experiencing a “false dilemma." In other words, she believes she is stuck in an awful predicament, when in reality, she is not. When AS and HFA children fall victim to a false dilemma, they have mistakenly reduced an entire spectrum of possibilities down to the two most extreme options, each the polar opposite of the other without any shades of grey in between. Often, those categories are of their own creation, and they are attempting to force the world to conform to their preconceptions about what it should look like. A false dilemma means seeing the world only in terms of extremes. If things aren't "perfect," then they must be "horrible." If your youngster isn't "brilliant," then he thinks he must be "stupid." In real-life, situations are almost always shades of gray – not black or white. Falling victim to a false dilemma tends to exacerbate depression, anxiety, and a host of other everyday problems. Unfortunately, under duress, AS and HFA children often regress to a primitive way of thinking. They are most prone to regressing to primitive thinking when they are having a hard time and feel overwhelmed by their own emotions. A “regression” is a backsliding from age-appropriate functioning/thinking to more immature ways of functioning/thinking. For that one moment, when the child starts relying on the words "always" or "never" and views the world in black and white terms, she is slipping back to the way she saw the world as a toddler. A false dilemma often creates “artificial needs” in the child’s life that lead to disappointment and depression. This is his tendency to think that he “must” have something, or he “must” do something, or life “must” be a certain way – otherwise it will be unbearable. The false dilemma doesn’t open him up to the possibility that, even if life doesn’t work out exactly the way he thinks it should, he can still be happy. When the child only see things in black and white, she misses out on alternative ways of viewing the world. These other perspectives may be just as good if not better than her current perspective. A false dilemma often creates a false choice between “A” and “B,” when “C” is the more accurate and helpful view. Unfortunately, if the child only thinks in black and white terms, then she is unlikely to even consider “C” a possibility in the first place. A false dilemma makes AS and HFA children less adaptive to their surroundings. This hinders their development. It’s also what keeps them stuck in old habits and thought patterns. A false dilemma doesn’t just hurt the child, but also the relationships he tries to build with others. When he views the world in strict and over-simplistic terms, he is less likely to compromise and cooperate with others to meet common interests. This is because he doesn’t see the grey areas in life (which is a mind-blindness issue that most kids on the spectrum experience). He believes everything needs to be a specific way, and he isn’t willing to deviate from this narrow view of the world. This makes him stubborn and frustrating to live with. Most AS and HFA children simply do not have the vocabulary to describe the middle ground. For example, the child either considers someone to be a friend or not. The concept of different levels of friendship and the gradual building of trust may be unknown. Perhaps worst of all for children on the autism spectrum is the perfectionism pursuant to a false dilemma – and the self-condemnation which may follow. Many AS and HFA children often think they should be doing everything “right,” because if it’s not right (i.e., perfect), it’s certainly wrong. In this way, the false dilemma may underlie some of the “refusals” and “difﬁculty initiating” that parents and teachers often see in these children. So, learning (which involves, ﬁrst, not knowing things and gradually learning them while making mistakes along the way) can be an excruciating process. Starting a writing assignment, for example, can be overwhelming to the point of paralysis. AS and HFA children need to be taught two important concepts: (1) gradual change and (2) the vocabulary fitting speciﬁc situations. Choose a metaphor to which your youngster may easily relate, and may ﬁt the situation you first want to address. Depending on the age of the child and cognitive level, you can use the real items, drawings, or just conversation to develop the “graduated levels” concept. 2. Never try to “reason with” a child on the autism spectrum. Logic, reasoning, and explanation unfortunately results in the youngster becoming angry and more insistent on his viewpoint. It is better to let him have his viewpoint. When you catch yourself feeling frustrated that he simply won’t listen to reason, you need to recognize that he is stuck in a false dilemma and end the conversation. At a later point in time, when he is calm, you can bring up the topic and together make a list of all the possible ways to view the situation or all the possible solutions. Write down all possible ideas regardless of how good they are, and do not make negative comments; otherwise, your youngster will become resistant. Write the pros and cons of each one and then discuss which idea looks the best. Through this technique, you are teaching your youngster how to look at situations from another perspective. He may still rigidly hold to his original idea, but at least you are teaching him how to consider other options. Also, you can encourage him to think about what someone else would do if they were in his situation. He may also be responsive to a suggestion that he ask others what they would do. • Anonymous said... I have Asperger Syndrome, and I also have trouble understanding where grey areas lie. Here are some things you can try that might help your child (or the child you work with) who is on the Autism Spectrum understand more about grey areas. Next time you have your child in the car with you, show him/her a traffic light, and explain what each of the lights mean. The red light means stop, the green light means go/keep going, and the yellow light means slow down and be ready to stop if you need to. If the traffic light has an arrow, this means it's only safe/unsafe to go in this direction. The yellow light and the arrow may be used as grey areas between stop and go. Also, have your child observe the light changing colors. Another thing you can do is while your child (or the child you work with) is waiting for his/her school bus, explain what the school bus lights and other signals mean. When the yellow lights turn on, this means that it's going to be time for your child to get on/off the bus soon, and that all other vehicles on the road should be ready to stop if needed. When the red lights turn on and the stop sign comes out, this means it's time for your child to get on/off the bus, and all other vehicles on the road NEED TO STOP, and may not go again until the stop sign closes and the red lights turn off. • Anonymous said... This is a great post, and would be really helpful in a video-type format, as my son's Aspie Dad has real issues with this, and would benefit from this info. Alas, he finds wordy posts like this make him tune out. On the other hand, it is a helpful read for me, so thank you!